Value Priced Color Post-it® Notes at Flaire Print Communications, Inc. The long lasting message that sticks around. Time to reorder? Log in to view your library of items. Send your project directly to us. No need to worry about file size. Give us some details, and we'll work up an estimate. 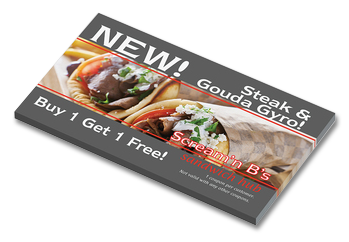 Promote your products and services with the brilliance of full color printed, personalized Post-it® Notes. 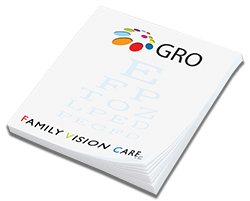 Using a 4-color process, the entire rainbow of colors can be printed to give your business a professional look, strengthened by the utility and constant use of 3M custom printed Post-it® Notes. 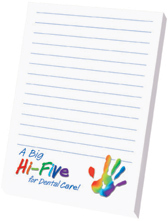 Keep your colorful message at your customers fingertips with this line of Custom Post-it® Notes from Flaire and 3M. Select one of two sizes of white Post-it® pads, each with the same adhesive as the original Post-it® Notes from 3M. Print set up is free, request ruled lines to be added free of charge. Call Flaire today at 866-428-9611 with your order. PD33P-25 2-3/4" x 3" 25 Sheet Pads .91 .62 .39 .35 FREE 720 16 lbs. PD33RP-25 2-3/4" x 3" 25 Recycled Paper Sheet Pads +10% +10% +10% +10% FREE 720 16 lbs. PD33P-50 2-3/4" x 3" 50 Sheet Pads 1.12 .88 .66 .61 FREE 360 16 lbs. PD33RP-50 2-3/4" x 3" 50 Recycled Paper Sheet Pads +10% +10% +10% +10% FREE 360 16 lbs. 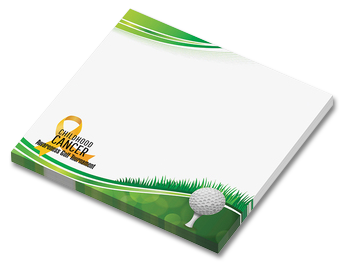 Orders must be placed in increments of 250 note pads up to a maximum of 5000 note pads. Promotion pricing only available for sizes and sheet counts listed. Add 15% for heavy ink coverage. 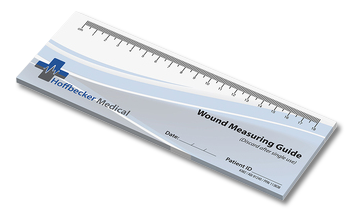 Bleeds are an additional charge. Call for quote and restrictions. 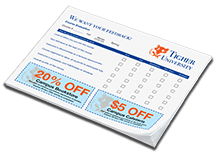 Diecuts, copy change, custom backsheets, and backside imprint are not available with this offer. PD34P-25 3" x 4" 25 Sheet Pads 1.00 .71 .41 .37 FREE 480 15 lbs. 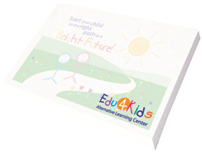 PD34RP-25 3" x 4" 25 Recycled Paper Sheet Pads +10% +10% +10% +10% FREE 480 15 lbs. PD34P-50 3" x 4" 50 Sheet Pads 1.20 .97 .73 .67 FREE 240 15 lbs. PD34RP-50 3" x 4" 50 Recycled Paper Sheet Pads +10% +10% +10% +10% FREE 240 15 lbs. PD46P-25 4" x 6" 25 Sheet Pads 1.55 1.05 .73 .67 FREE 240 15 lbs. PD46RP-25 4" x 6" 25 Recycled Paper Sheet Pads +10% +10% +10% +10% FREE 240 15 lbs. PD46P-50 4" x 6" 50 Sheet Pads 2.18 1.65 1.26 1.08 FREE 120 15 lbs. PD46RP-50 4" x 6" 50 Recycled Paper Sheet Pads +10% +10% +10% +10% FREE 120 15 lbs. PD68P-25 5-13/16" x 8" 25 sheet pads 1.82 1.39 1.25 FREE 160 21 lbs. PD68RP-25 5-13/16" x 8" 25 Recycled paper sheet pads +10% +10% +10% FREE 160 21 lbs. PD68P-50 5-13/16" x 8" 50 sheet pads 3.01 2.58 2.36 FREE 80 21 lbs. PD68RP-50 5-13/16" x 8" Recycled paper 50 sheet pads +10% +10% +10% FREE 80 21 lbs. PD331P-25 3" x 3" 25 sheet pads .65 .40 .36 FREE 480 13 lbs. PD331RP-25 3" x 3" 25 recycled paper sheet pads +10% +10% +10% FREE 480 13 lbs. PD331P-50 3" x 3" 50 sheet pads .92 .69 .63 FREE 240 13 lbs. PD331-RP-50 3" x 3" 50 recycled paper sheet pads +10% +10% +10% FREE 240 13lbs. PD35P-25 3" x 5" 25 sheet pads .80 .57 .52 FREE 320 14 lbs. PD35RP-25 3" x 5" 25 recycled paper sheet pads +10% +10% +10% FREE 320 14 lbs. PD35P-50 3" x 5" 50 sheet pads 1.31 .99 .87 FREE 160 14 lbs. PD35RP-50 3" x 5" 50 recycled paper sheet pads +10% +10% +10% FREE 160 14 lbs. PD38P-25 3" x 8" 25 sheet pads 1.05 .73 .67 FREE 320 20 lbs. PD38RP-25 3" x 8" 25 recycled paper sheet pads +10% +10% +10% FREE 320 20 lbs. PD38P-50 3" x 8" 50 sheet pads 1.65 1.26 1.08 FREE 160 20 lbs. PD38RP-50 3" x 8" 50 recycled paper sheet pads +10% +10% +10% FREE 160 20 lbs.